Have you ever done the experiment of seeing how many drops of water you can get onto a penny? It’s quite amazing how many drops you can actually get on the penny before it overflows. This is a metaphor for my life. I am the penny and there are times in my life when the amount of water that I need to carry around is very manageable. These are my day-to-day activities: work, exercise, basic needs, quality time with my husband, etc. However, there are times when the water droplets keep piling on and the activities of life become more demanding. This happens to all of us, I know. I am not unique in this way. I am a self-proclaimed perfectionist and was always someone who got damned near flawless grades in school. Math was a subject I was good at and enjoyed in high school.1 It just made sense to me. It was logical and there was always a right answer. It lacked the subjectivity of what constituted a good essay or quality literature. 2+2 is always 4. I was humbled when I went to college and took multivariable calculus and discrete mathematics. I struggled with both. My visual-spatial skills weren’t what they needed to be for multivariable calculus, and I withdrew from the course. I did complete discrete mathematics with a B-, but I had never worked harder for and felt so proud of a B-.2 I learned from this experience that I was far from perfect and had to accept that I need to be flexible with my expectations for myself. I wish I had remembered this when I welcomed Weight Watchers into my life. Weight Watchers gave me daily “points” which roughly translated into calories I could consume. You could also earn more calories by earning activity points. To put it simply, if you exercised, you could eat more. I had done home workout videos since my teenage years, but I didn’t really lose weight. The idea of earning activity points enticed me to start focusing on exercising more efficiently, hence a gym membership. I did learn a lot about exercise from my personal trainer, but my perfectionism began to slowly embed itself into my exercise routine. If working out 4 days a week was good, then working out 6 days a week was better! If burning 300 calories was acceptable, then 400 calories was superb! What ended up happening was that I began a weekly workout routine that I stuck to religiously. When I felt sick, I still went but I “took it easy”, but my version of “taking it easy” wasn’t really “taking it easy”. Eventually I started feeling the results of overexercising. There were a few minor aches and pains along the way, but in the summer of 2016 my elbow got really wonky.3 I had trouble bending my left arm all the way up without elbow pain. I tried to “take it easy”, but my elbow wasn’t getting better. By this time, I had been doing IE for about a year. I had a good grip on my eating,4 but my husband kindly, yet consistently, told me that I was working my body too hard. I reflected on my gym history and realized that I had slowly increased the amount of exercise in my week to a staggering amount. My body didn’t have time heal and recover between workouts. Did I really need to go that often when I put in 100%+ when I do go? As tough as it was for me mentally, I decided to take two weeks off of working my upper body to rest my elbow. I feared that fat would invade my body or I would lose all of my upper body strength. That didn’t happen. After the two weeks, my clothes fit the same, my upper body muscles were still there, and my elbow felt better! When I got back into the gym, I tweaked my workouts so I was gentler to my body and allowed it time to recover between workouts. The big AH-HA moment was when I realized that my workouts were more satisfying and invigorating when my muscles were rested! I came to the conclusion that since my relationship with food had improved quite a bit, it was time to focus on principle #9: Exercise—Feel the Difference. Though I still love to go to the gym and beat up the spin bike or make some muscles, I have learned to find pleasure in other forms of movement. More importantly, this experience has taught me to listen to my body and to be gentle to it. Self-compassion is hard for me, but this is the only body I have so I must be kind to it. It was the perfect storm in early 2017, about 1 1/2 years after starting IE. In addition to my day-to-day responsibilities, work was making me miserable. I was looking for another job, I started doing my yoga teacher training and my IE counseling certification, and I was dealing with the myriad of emotions that arose with the one year anniversary of my father’s death. Each of those was an additional droplet (or two or three) onto my penny. My penny didn’t overflow, but it got close a few times. My stress was intense and was physically manifesting itself in different ways. I felt sick though I hadn’t caught a virus, and I woke up feeling tired every morning because I was so tired I couldn’t sleep.5 In the past, exercise helped me de-stress, but this was beyond my normal stress. I was exhausted. I knew that doing full workouts at the gym would only do me harm. 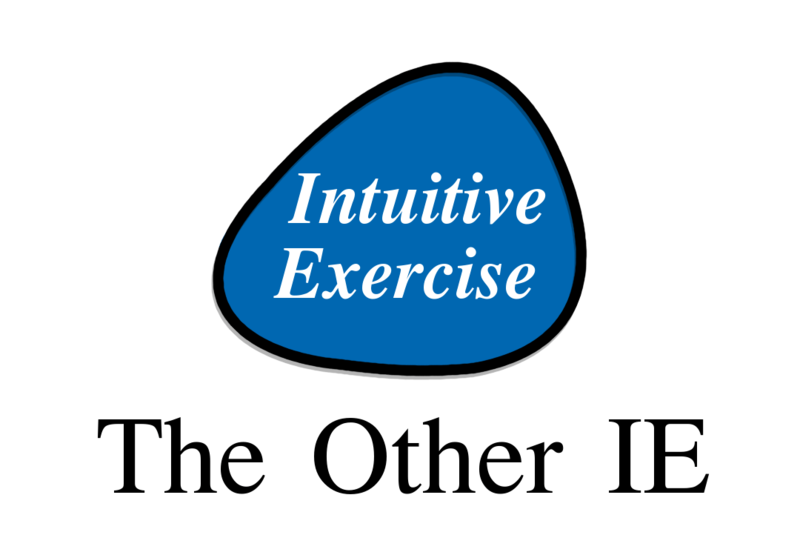 This is where intuitive exercise came in for me. I am not one to sit around. I enjoy movement in my day, but I knew I had to modify based on my body’s current needs. Movement would be fine, but doing a full-blown work out would not. I incorporated more yoga into my days, and I really did take it easy when I went to the gym. It was OKAY that my heart rate wasn’t in the zone the whole time. My body was screaming at me to slow down. So I did. What is your relationship with exercise like? Please share in the comment section below! 1Though I could have done without geometry. 2I think the teacher threw a pity B- my way, but I’ll take it! 3That’s the medical term for it! 6I tried to do a play on “Pork.The Other White Meat”. Did that anyone catch that? Thank you for sharing your journey to intuitive exercise, I really enjoyed reading it! Thank you for reading! I appreciate the feedback as well. It’s a shame you injured your knee, but that was probably your body telling you to take it easy. Here’s to a quick recovery!